Location:2500 2nd Street S. W.
Typical Job Costs:$450/slab - $875,000 total jobLow end single interior door @$450 to total custom doors and millwork packages both residential and commercial. We work mainly in the Western and Southwestern areas of the country. 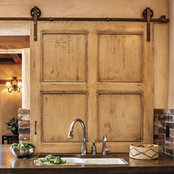 We have been in business for over 30 years and our team of highly qualified craftsman build our doors in our plant in Albuquerque. We have the capability to build in any style, from the modern to Spanish Colonial. That is the beauty of having a custom shop.